Waterloo: Robert Dewaine Gray, 92, of Waterloo, died Thursday, April 11, at Sunrise Care Center, Traer. He was born December 11, 1926, in Brandon, the son of Arthur Lee and Sophia Irene Bauer Gray. He married Roberta Weber on June 14, 1948, in Raymond. Robert served in the United States Army during World War II and was employed at Rath Packing Company of thirty-four years. Robert enjoyed motor vehicles, horses and flying with his grandson. 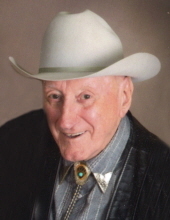 He had a love for Texas where he and Roberta wintered and was a fan of country western. Survivors include: his wife, Roberta of Waterloo; a daughter, Connie (Joel) Cizek of Waterloo; three grandchildren, Angela (John) DeKoster of Waterloo, Charles (Carry) Cizek of Waterloo, and Michael Cizek of Waterloo; six great-grandchildren, Katelyn, Caleb, Christopher, Madison, Caly, and Charlie; and one great-great grandchild. Services: 11:00 a.m. Wednesday, April 17, at Sacred Heart Catholic Church with burial in Mt. Olivet Cemetery. Public visitation from 5-7 p.m. Tuesday at Hagarty-Waychoff-Grarup Funeral Service on South Street, where there will be a 5 p.m. Knights of Columbus rosary and 7 p.m. vigil service. Visitation also one hour prior to services Wednesday at the church. To send flowers or a remembrance gift to the family of Robert Dewaine Gray, please visit our Tribute Store. "Email Address" would like to share the life celebration of Robert Dewaine Gray. Click on the "link" to go to share a favorite memory or leave a condolence message for the family.